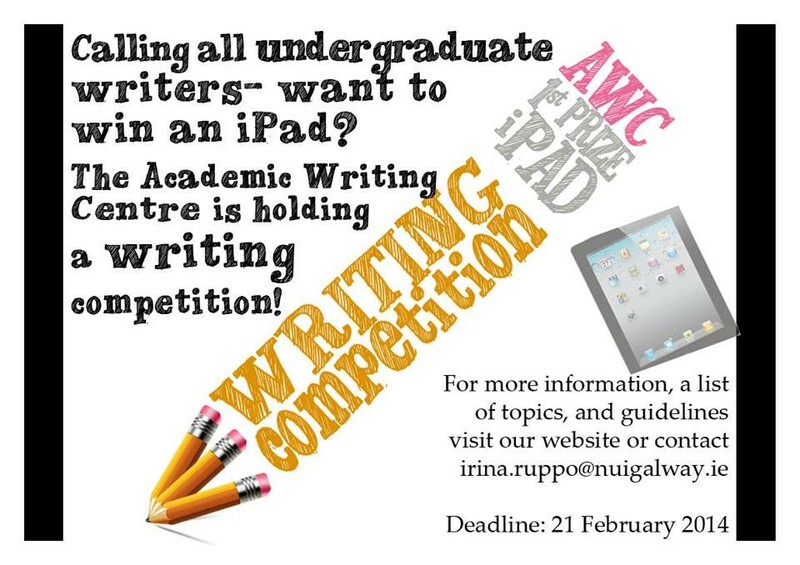 The deadline for the Academic Writing Centre’s competition for academic writing is fast approaching. The prize is an Apple iPad2. So, it’s time to get writing. The centre runs projects to promote good writing, to highlight what academic writing can achieve in terms of style and quality, and to demonstrate its application beyond the world of academia. On its website, tutors review books on academic writing – in Irish and English – in the ‘Book of the Month’ slot. Their website also publishes faculty recommendations illustrating specific writing ‘etiquette’ demanded across individual disciplines. Feature of the Month focuses on academic articles, or examples of writing; journalistic vs. academic writing, for example. Ruppo Malone says the competition is seen as “a method of self-expression and a chance to take a developed skill to another level”. The variety of topics set by the AWC allows students to show off in the same way that debating is a platform for verbal dexterity. Dr Ruppo Malone emphasises the fact that the Centre’s writing competition is open to students from all faculties in the University. The competition is open to undergraduates only. Course work may not be submitted. Satirical or jocular work is encouraged. The Harvard System of referencing must be used, and the piece must include citations from one or two published sources available at the James Hardiman Library (including databases). 1. Given that many people in what we call ‘first world’ countries have easy, and often instant, access to information via the internet, what should education look like? Is there still an argument to be made for the memorisation and rote learning that often occurs? 2. Should governments fund programmes for space exploration? 3. Is social networking an anti-social phenomenon? If this is the case, is it a negative development? If this is not the case, what is the actual impact of social networking on society? You are encouraged to ask further questions and develop an original argument along this line of enquiry. 4. Identify a commonly held perception and explain why it is incorrect. The following are examples of such perceptions: ‘votes for women was a great cause with a positive outcome’; ‘everyone has a right to education’; ‘one must distinguish between dreams and reality’; ‘homicide is not civilized behaviour’; ‘modern life owes a debt of gratitude to Thomas Edison’s inventions ; ‘we cannot escape the burden of the past’. Any commonly held perception in any field is acceptable. However, your piece may not contain anything libellous. Any queries about the competition may be emailed to Irina at the above address. Or see the AWC Facebook page .